Salman Khan is trending on social networking site, Twitter with the keywords, 24 Million Salmaniacs On FB. 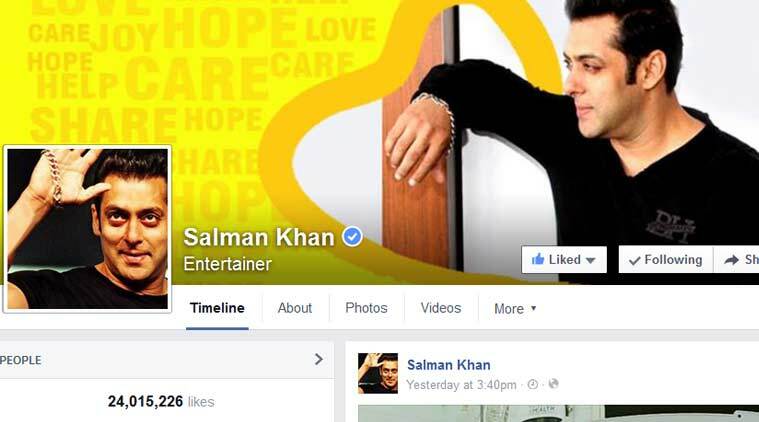 Salman Khan has over 24 million followers on Facebook. Bollywood superstar Salman Khan sure has some massive fan following. Thanks to his ability to connect to his fans and of course keep them entertained with his onscreen hits like ‘Kick’, ‘Ek Tha Tiger’ and ‘Dabangg’, the Bollywood superstar has over 24 million followers on Facebook. The ‘Bodyguard’ actor is also trending on social networking site, Twitter with the keywords, 24 Million Salmaniacs On FB. Salman Khan is currently shooting for two of his upcoming films, ‘Bajrangi Bhaijaan’ and ‘Prem Ratan Dhan Payo’.